Someone asked me recently how I find stories for this blog. I didn't quite know how to respond as there are so many stories here, they all deserve telling, and yet I can only tell so very few. I suppose I tell those stories that resonate with me, the ones that somehow catch my attention and manage to hold on to it. This happened one day on Twitter when someone with the Twitter name "spindleprincess" tweeted that she was in Calgary - to pick up a new spinning wheel. I was intrigued instantly. It appeared she was a Fort Mac resident, and she was going to get a spinning wheel. Did anyone really do that anymore? Images of Sleeping Beauty sprang to mind, of course, and of spinning wheels I'd seen in heritage museums. 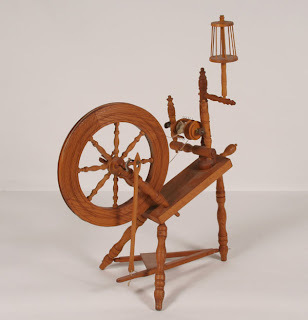 I had to know more, and so I tweeted to ask about this spinning wheel. She replied promptly - not only does she spin, she does this for a living. And that, people, is how these stories begin. I arranged to meet Michelle Boyd, aka spindleprincess, at my favourite local coffee shop Coco Jo's. Incidentally this is where she and her group of merry knitters and spinners meet every Saturday, too, and so I had a chance to see them in action with spindles and yarn, knitting needles flying. Now, for those of you that think knitting is old-school and something your grandmother did I have news - knitting is consider uber-cool these days, and has experienced a resurgence in popularity, especially with the younger crowd. The desire to get back to basics - eat local, downsize, make your own goods - has created a huge interest in knitting, and spinning is one of those things that just naturally follows that trend. If you aren't sure about whether or not knitting is cool then check out yarn bombing - and if you don't think that's cool then I'm not sure there's any hope for you. When I met Michelle the first thing that struck me is that she's gorgeous in every sense. The woman just glows, and perhaps it's due to her passion for what she does - because people, she has a passion for string. Michelle is what is now called a "fibre artist" - and there is no doubt that what she does is art. From the spinning of the fibres (things like cashmere and silk, which sound so heavenly) to the creation of the pieces (sweaters, wraps, scarves, and more) there is an art to this that cannot be denied. There is a whole world to this fibre art, too, with Olds College even offering courses in spinning - courses that Michelle, a master spinner, teaches on occasion. Michelle didn't start out planning to be a master spinner and spending her days and nights crafting yarn. Like all of us she has done other things, but this all really started 15-16 years ago for her, and became a passion that could not be contained. She knew it was important when she suffered an accident and broke her wrist and was unable to spin. That was her epiphany - that was when she realized that this was no longer just a hobby but rather a passion, and a calling. Now Michelle travels all over North America to teach spinning. She writes articles for magazines, she maintains an active website and blog, she shows and sells her products (now in Frames and More, people, go check it out! ), and she has turned her "hobby" into a career. There are three words that have appeared a lot in this blog : passion, vision, and drive. I've met so many people here who embody those words, and Michelle is yet another example. Her passion is inspiring, her vision is clear, and her drive makes her unstoppable. When Michelle and I talked she shared funny stories, like when she was turned back at the US border because they could not believe she was coming to the country to teach spinning, and were sure she was there for nefarious purposes. We talked about how sometimes passions don't lead to fame or glory or money but how they somehow fill your soul. She spoke of the "rightness" of spinning, and how it seems to connect with something primal in our nature, some level of us that goes right back to caves and the warm glow of firelight as ancient humans were forced to forge their own garments instead of getting them from overseas sweatshops. We even spoke of the controversial theory that the wheel - the basis for much of the evolution of our civilization - may have been inspired by wool being spun around a spindle, the spindle escaping the hands of the spinner, rolling down a hill, and perhaps causing the greatest invention we've ever seen. We talked about how without "string" we could not have developed our civilization, and how we would still be shivering in caves. We talked about spinning, about taking a ball of nothing, just wool, and turning it into something, and the alchemy of that act. We talked about a passion that may have taken over Michelle's life but that has also given her so much in return - including that light in her eyes when she talks about it. So, people, this story began with my curiousity about a spinning wheel and ended with me meeting someone with the passion and vision I love. It ended with me meeting yet another Fort Mac resident who has taken the opportunities in this city and built upon them in her own way, and who has forged her own path. If you are curious like me, and if you would like to see Michelle in action, the Fibre Arts Group meets every Saturday at Coco Jo's at 1 pm. All are welcome, it's a free informal drop-in, and I'm pretty sure that within 5 minutes you will have a spindle in your hand and you will be engaging in the alchemy of spinning. That's the funny thing about people like Michelle - they have a way of making you understand their vision, feel their passion - and making you want to feel it, too. Such a nice read! Fiber art is both heritage and hot! Awesome! I've been knitting for years but the spindle sounds like a lot of fun! Jut stumbled upon your blog, and it's wonderful to read about folks with passion and drive. Inspiring! I'm curious about food prices there, and maybe you have covered that elsewhere...I'll keep looking.